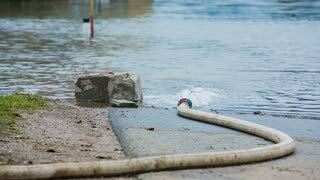 Search Results for "heavily flooded"
Flooding People Fire. Pedestrians watch helpless, as a suburban home burns. The surrounding area is heavily flooded. Army and police rescue teams saving people from heavily flooded city Obrenovac in Serbia, May 2014. THAILAND, BANGKOK, MAY 1978. Two Shot Sequence Of Heavily Flooded Street With Lots Of Traffic In The City Center. Aerial view on heavily flooded areas in Serbia 2014. Relief Center New Orleans. Overview of a residential area heavily effected by flooding and a broken levee post Hurricane Katrina in New Orleans. Features flooded and dry areas. Cars driving through an intersection while it is raining heavily and flooding. Green light switches to red light. Relief Center New Orleans. Overview of a residential area heavily effected by flooding and a broken levee post Hurricane Katrina in New Orleans. Features relief choppers crossing through the frame as debris floating in the water. Relief Center New Orleans. Overview of a residential area heavily effected by flooding and a broken levee post Hurricane Katrina in New Orleans. Features relief choppers crossing through the frame as well as the burning cityscape in the distance. Pea-sized hail can fall heavily for tens of minutes in some hailstorms, piling up to significant depths, and then be wash into giant hail rafts by floods and runoff. Heavily breathing shirtless athletic man with barbell on floor of gym recovering power looking extremely tired. Flying close to flooded water. Aerial shot of flooded area in countryside of Slovenia. Houses in water, farmland and objects flooded. 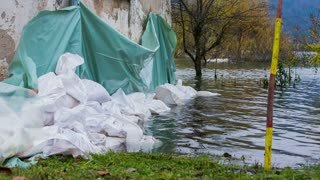 Sand bags around the house walls saving from flood. Flooding disaster after massive rainfall, houses in danger of being flooded.